Scott & Nix has been publishing an excellent series of field guides that cover individual states. The first to publish was New Jersey and since then six more states have come out: Colorado, Florida, California, Pennsylvania, Texas and New York. Word is that Arizona is about to be released and Minnesota, North Carolina and other states are in the pipeline. The guides, all of which feature photographs by Brian Small, are wonderfully illustrated and are written by top-notch (ahem) birders. But not everyone wants a field guide that covers the birds of a single state. 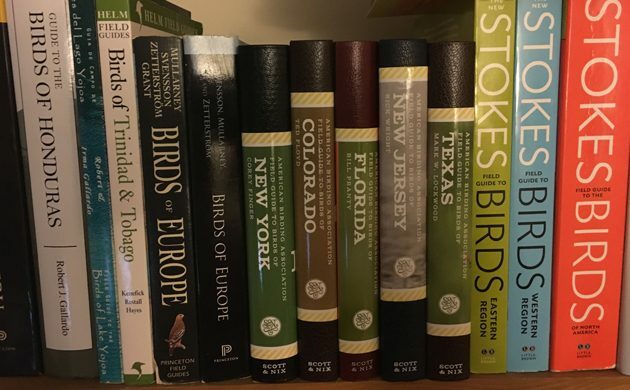 After all, Sibley, Peterson, the Stokes, Kaufman, and National Geographic all cover the birds of North America so why limit yourself with a book that only covers the birds of a single state? Read on, dear reader! As you might have surmised from the title of this post I have five reasons for you to buy one of these wonderful field guides…and here they are in no particular order. The authors were chosen largely because they are knowledgeable about the birds of their state. When you read one of these guides you learn much more about birding a particular state than you would from a guide designed for all of North America. Not only does each book offer excellent introductory materials but even in the species accounts you can learn a great deal about the specifics of finding the birds in the particular state covered by the guide you are reading. The photographs are awesome. Seriously, Brian Small has an excellent photo library and each book uses hundreds of crisp, clear, images, selected both for their intrinsic quality and because they show the field marks that the authors felt were important to highlight. The books are designed for beginning to intermediate birders. Which, if you are one, great! Buy a book! But, if you have progressed beyond that point you probably know about twenty people who are tangentially interested in birds. These books make wonderful gifts! Who wouldn’t want to open up a present and find out it is a book about birds? In fact, you should buy several of each guide because you never know when you might meet someone getting into birds in another state and you want to be prepared to give them a present. The American Birding Association gets a chunk of the proceeds from each book. Buying one of these is like writing a check to the ABA! How great is that? What are you waiting for? Get out there and buy all of the American Birding Association field guides. You’ll be glad you did! Awesome, Corey! Congratulations on getting your book out!! Something about this post doesn’t quite scan right. I feel that the statements “1.The authors were chosen largely because they are knowledgeable about the birds of their state. ” and “5.The New York book is written by me! ” contradict each other…. Dammit I typed that and saw Jochen made the same comment! Congrats…to get published like that has to be every serious birders dream!! It is mine any way. Congratulations, Corey! Next time I go to NY I will definitely get one! Meanwhile I hope Washington is one of the next states. Love seeing this–I just blogged about the possibility of state field guides (WA has an excellent one put out by the WA Ornithological Assn) for readers so this release of several and others in the works is great news! I’ll link to this from my blog.